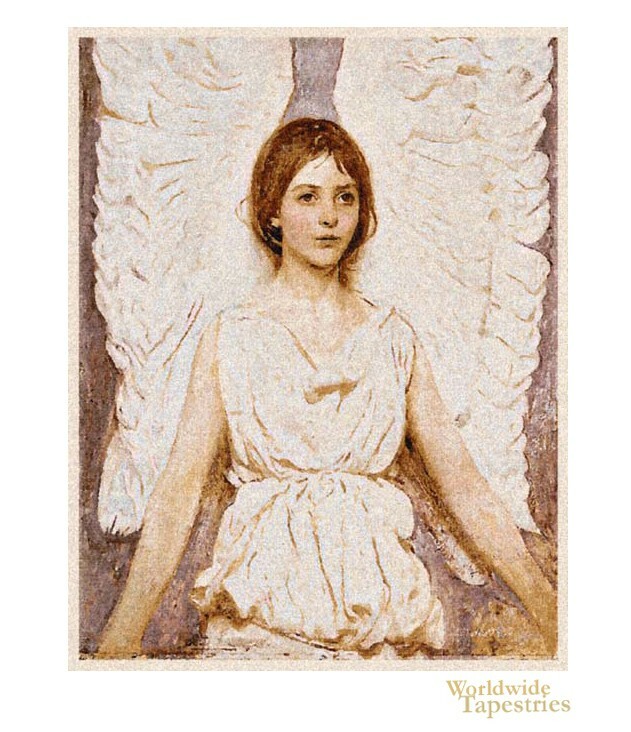 This angel tapestry "Angels Thayer" shows the work of Abbott Handerson Thayer from 1887. Thayer was an American artist who's portraits of angels, people , animals and landscapes became prominent in the place of major art galleries during his lifetime. His works of portraits in particular are striking in their appeal due to the true to life facial expressions of his subjects. Here we see an angel with an unusual formation of wings, almost like an extension of her garments n their texture. His topics were often women with embodiments of various virtues, and this piece may be seen as an angel, or a woman with angelic qualities. Either way, the work is beautiful and the use of color is truly cohesive an almost hypnotic. This angel tapestry "Angels Thayer" is lined and has a tunnel for easy hanging. Dimensions: W 28" x H 37"